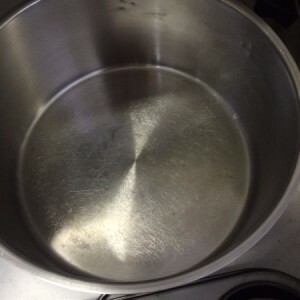 Heat and salt are enemies of cookware. Do not use excessive heat. It will cause rainbows on metal cookware and discoloration on enameled cast iron like Le Creuset. If you want to salt the water, wait until it boils. Failure to do this will cause pitting on metal cookware. This pot is over 30 years old. Source: Williams Sonoma cooking class. I've rented out sleeping rooms in this bad economy and much to my surprise 95% of the women don't know how to cook or treat my stainless steel cook ware! They turn on the burner and walk away to talk on the phone, meanwhile my pots are being ruined. If I try to explain to them how to treat them they become offended. Why don't these women (ages 23-60) learn to cook? Too much fast food I suspect. Anyway, I've finally resorted to doing this: Fill the pot with water and boil on the stove for 5 mins. let it cool for an hour then clean the pot. If that doesn't work I spray the pot with EZ Off Oven Cleaner for cold cleaning or outdoor grills. Let it sit overnight then wash & dry it. To get back that lovely SS shine I heat the cleaned pot and pour a couple of drops of oil in it. Then I rub the oil all over the pot with a paper towel. Done. Good ideas! Thanks for posting. You might try getting some beat-up pots at Goodwill or the Salvation Army. If they're just going to ruin them i wouldn't let them use my good ones.